As I mentioned in my previous post on Yorkshire mills and merchants, Pennine is one of the best independent mills left in the area. It is also the largest worsted weaver in the UK, with 32 Dornier looms, and weaves 30,000-35,000 metres a week (most for RTW). It reinvests at least 10% of its turnover every year, and recently bought only the second drawing-in machine in Europe – the first went to Cerruti in Italy. 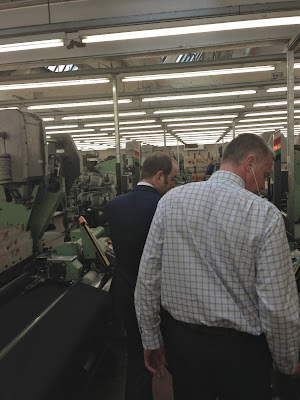 Walking around the mill, you will see basic Super 80s twill on the same looms as Super 180s with cashmere. Finer cloth is generally woven slower, but otherwise there is no difference in the weaving process for these cloths. The difference is in the fineness (Super 100s number), the way the yarn is spun, the set of the weave (2×2, 2×1 and other factors) and then, elsewhere, the finishing. Pennine weaves for most of the big merchants, including Dugdale and Holland & Sherry, and Dormeuil puts around 85% of its cloth through here. Interestingly, though, the trend in recent years has been for smaller and smaller lengths of cloth. 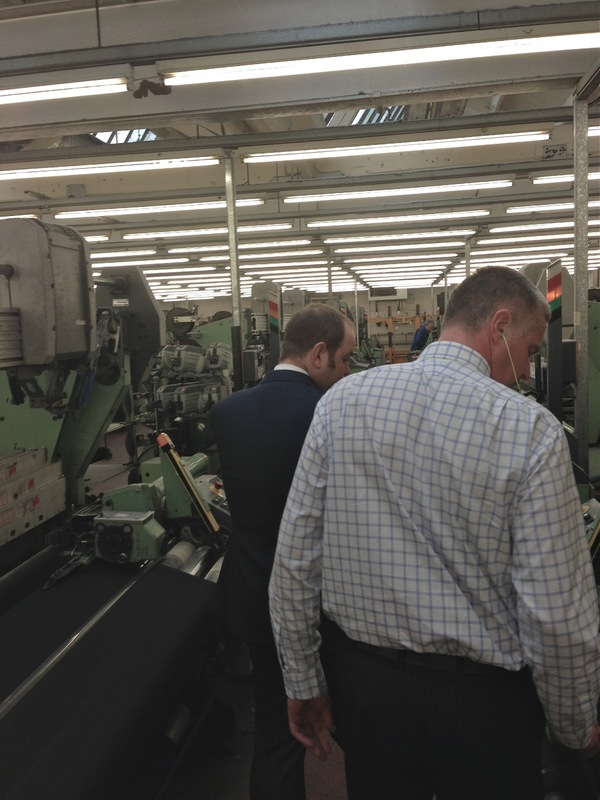 Pennine’s minimum is only 15 metres, and Dormeuil recently put through an order of 40 sets of 15-metre lengths, for one particular customer. Small lengths are disproportionately more work because the thing that takes the most time and manpower is not the weaving itself, but preparing the warp for each length and then drawing it in. The warp is the yarn that runs the length of the cloth. To prepare it, precisely the right amount of yarn in each colour must be taken off cones, in the right order. Hundreds of ends over possibly hundreds of metres, all calculated on a yellow order sheet with graph-paper section showing the appropriate pattern (an old Dugdale pattern is pictured, top). Even a plain navy might have several different shades of blue in it, and black. That warp is then transferred onto a beam that will sit at the back of the loom and feed it in, with the weft shuttling back and forth across it, coming from its own cones on either side of the loom. The warp must also be attached onto the loom, however, which is where the drawing-in machine comes in. Every end must be tied on. To do it by hand takes a day; the latest machine, which Pennine developed with Stäubli, does it in an hour. Once everything is connected, the loom can start weaving. The only job required is for someone to tie on ends when the yarn breaks. Across Pennine’s 32 looms, that might happen every few minutes. The status of the looms can be monitored from a programme that also runs as an app on an iPad – so Gary can monitor them wherever he is. 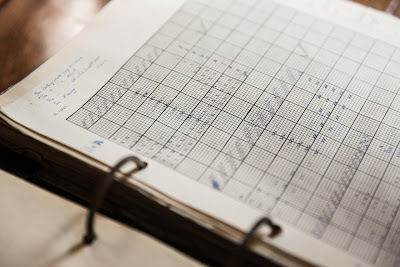 A quick aside on weaving machinery: there is little benefit to older looms or older processes. If mills use old machinery, it’s because they can’t afford to buy new ones (they can cost up to £100,000). Old weavers, such as Fox, are gradually replacing their old looms and their flannel is no longer finished by bashing it against a wall (as we shall see in the next piece, on finishers WT Johnsons). Perhaps the most impressive thing I saw at Pennine was the repairing of some Dormeuil cloth. One person was removing an errant navy thread (which I couldn’t see, even when it was pointed out) and replacing it with black. She tries to tie the new thread onto the old, and then pull it through the cloth. But the yarn often snaps because it is so fine. So she has to weave it in by hand, with the cloth containing perhaps 108 picks per inch. The whole process takes 10 days. You can follow the discussion on Pennine Weavers, Yorkshire by entering your email address in the box below. You will then receive an email every time a new comment is added. These will also contain a link to a page where you can stop the alerts, and remove all of your related data from the site.